We’d love your help. Let us know what’s wrong with this preview of Keeping Faith by Beverley Oakley. Revenge is sweet until it breaks your heart. Fai Revenge is sweet until it breaks your heart. But when Faith is recruited as the muse of a talented, sensitive painter whose victory in a prestigious art competition turns them both into celebrities overnight, she discovers the reasons behind her mission are very different from what she'd been led to believe. 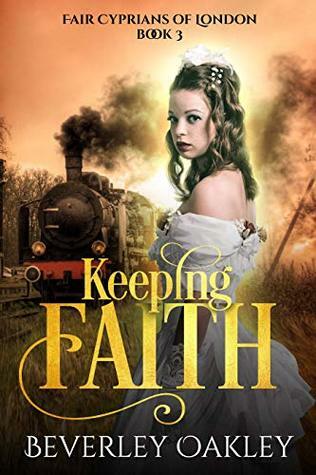 To ask other readers questions about Keeping Faith, please sign up. Faith💃 is one of nine children from a dirt poor family with an abusive father, when she gets a job as a maid in wealthy Mrs. Gedge's home. Mrs. Gedge's daughter slits her wrists over a romantic snub from a titled young man, Crispin Westaway🐺. Faith💃 is a beautiful blonde 14 year old maid and she finds a gold and garnet bracelet on the floor, placed there by Mrs. Gredge👹 so that she can accuse Faith💃 of trying to steal it. Now she controls Faith's life upon threat of arrest! Mrs. Gredge👹 sends Faith💃 anonymously to the best and most classy bordello in London and hires tutors to educate her. She pays for her complete education of how to Be a courtesan. All for revenge over the young man Crispin🐺! Crispin🐺 is a very good painter🎨 at heart, but his father insists he follow him into diplomacy as a career. Crispin🐺🎨 would rather be an artist🎨 but he also wants to please his father. He is torn. The book was $3.99 on Amazon at the time of This Review. An absorbing story about a very poor girl from a large family. She is fifteen and working as a maid. Mrs. Gedge takes her to London and she spends three years learning all sorts of things educated, taught how to speak and act like a lady. She also learns how to dress for the best affect. Lady Vernon is a coconspiraator she helps Mrs. Gedge. Her daughter comitted sucide because she wanted Crispin to marry her and they were just not compatible. Crispin Westaway is a young man whose father wants hi An absorbing story about a very poor girl from a large family. She is fifteen and working as a maid. Mrs. Gedge takes her to London and she spends three years learning all sorts of things educated, taught how to speak and act like a lady. She also learns how to dress for the best affect. Lady Vernon is a coconspiraator she helps Mrs. Gedge. Her daughter comitted sucide because she wanted Crispin to marry her and they were just not compatible. Crispin Westaway is a young man whose father wants him to go into the diplomatic corp. in Germany. He is also a painter but has given up his art so he could consentrate on the skills need for diplomacy. He meets Faith and they fall in love. There a lot of twists in the plot for this tale and a lot of characters but they are important to the storyline. It was writen cleanly, is easy to read and is evenly paced. I love the part where you watch Crispin and Faith fall in lovefall in love and trust each other. Ms Oakley has done such a great job of weaving the book that is very hard to put done. I highly recommend it and look forward anixously for more. This is almost two stories in one. Faith has been groomed to play a starring role in an intricate revenge plot against Crispin Westaway. Having fallen in love, Faith tries to outwit her puppet masters, but fails. She manages to land on her feet, fleeing London and finding work as a governess, until she's recognized by one of Crispin's friends. Here the "second" story begins when she learns Lord Harkorn may destroy Crispin and rushes back to London to try to thwart him yet stumbles into dealings y This is almost two stories in one. Faith has been groomed to play a starring role in an intricate revenge plot against Crispin Westaway. Having fallen in love, Faith tries to outwit her puppet masters, but fails. What an intense, tangled web of revenge. Very detailed plot opened up to much more of a mystery than I was expecting. Gotta have Faith, she is strong, a survivor, very smart yet rightly naive. I like Crispin too but he is slow to put the deceitful puzzle together. Very interesting depiction of the secret endeavors of London brothels and the power of love. I am voluntarily reviewing a free copy. The third book in the Fair Cyprians of London series is well written a story that I enjoyed reading. Faith had to go through a lot of things before she got a happy ending. I would recommend this book. I received a copy of this book and I am voluntarily reviewing it. I enjoyed reading this book. I liked the interaction between the main characters. I thought their connection was a one that kept them tethered to each other even through times of doubt. I think that others would enjoy reading this story as much as I did. I would love to read more in this series and other series by this author. I would recommend it to anyone who enjoys historical romances. I have been loving reading this series. I took a chance on this series and am so glad I did. Fantastic characters and wonderful storylines. I found this one to be completely immersive and could easily imagine everything that was happening. Wonderful work. Beverley was seventeen when she bundled up her first 500+ page romance and sent it to a publisher. Rejection followed swiftly. Drowning one’s heroine on the last page, she was informed, was not in line with the expectations of romance readers. So Beverley became a journalist. After a whirlwind romance with a handsome Norwegian bush pilot she met in Botswana, Beverley discovered her “Happy Ever After Beverley was seventeen when she bundled up her first 500+ page romance and sent it to a publisher. Rejection followed swiftly. Drowning one’s heroine on the last page, she was informed, was not in line with the expectations of romance readers. After a whirlwind romance with a handsome Norwegian bush pilot she met in Botswana, Beverley discovered her “Happy Ever After”, and her first romance was published in 2009. Since then, she’s written more than fifteen sizzling historical romances laced with mystery and intrigue under the name Beverley Oakley. With an inspiring view of a Gothic nineteenth-century insane asylum across the road, Beverley lives north of Melbourne with her gorgeous husband, two lovely daughters and rambunctious Rhodesian Ridgeback, Mombo, named after the Okavango Delta safari lodge where she and her husband met.